Another blended malt from Douglas Laing, thing I think most about these is that they offer a superb whisky for those who perhaps cannot justify paying more than forty pounds on a bottle of whisky but still want quality, time and time again Douglas Laing are showing the world of whisky that blends can be best and I salute them for that. 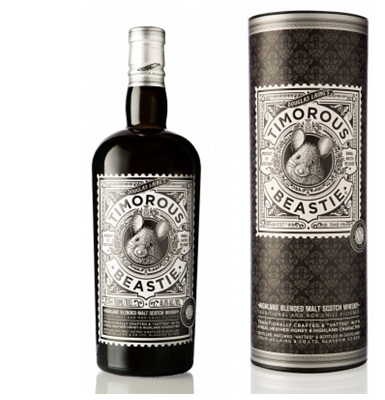 Timorous Beastie is the Highland offering so we’ll find Dalmore (everything without a distinct distillery attached is Dalmore isn’t it?) as well as Glen Garoich and Glengoyne the latter two are very fine whiskies indeed so I looked forward to opening this bottle which is bottled at 46% and non chill filtered as whisky should be. Nose. Sharp white wine notes, dried strawberries and heather honey, it relaxes after ten minutes in the glass with a drop of water to reveal crisp apples and hazelnut and toffee. White pepper and a touch of cloves. Palate. What I expected to be honest, warmth but not biting and lavender, heather honey and a nice malty backdrop. A touch of chocolate and maybe chocolate milk sweetened with honey, touch of maple syrup, that woody sweetness really comes out with a touch of water. Finish. Long, longer than the others in the range, a chewy caramel finish with a slight white pepper heat, very pleasing. Bravo, a superb dram and one I’ll buy again in the future, aye. nowt cowerin here.